Bradt's Paraguay- the only English-language guidebook to this emerging tourism destination - covers the region with unrivalled detail and knowledge. It delves deep into a country that has so far eluded the grasp of mass tourism and where rich indigenous culture and folk traditions still hold strong.This is the only stand-alone guide to Paraguay in English. The author has an intimate knowledge of the country having lived in the Paraguayan countryside since 2010. Paraguay is still largely undiscovered by travellers, but those who make their way here are delighted by the country's distinctive culture and strong indigenous features. A bilingual nation, with Guaraní spoken alongside Spanish, its folk-dance tradition is hugely popular among young people; its harp playing is legendary; and Paraguayans are proud of their different handicrafts, particularly their sewing. The country is also home to the historic Jesuit missions, or reductions (as depicted in the film The Mission). Bradt's Paraguay covers the region with unrivalled detail and knowledge. It delves deep into a country that has so far eluded the grasp of mass tourism and where rich indigenous culture and folk traditions still hold strong. Walk around Asunción's historic centre and admire the grandeur of colonial-era buildings like the Palacio de Gobierno, styled on the Palace of Versailles, before hitting market stalls selling traditional arts and crafts. Paraguay is an under-explored pocket of South America, boasting rich wildlife, lush forests, and mighty rivers. This land-locked country is home to a proud Guaraní culture, as well as the 16th-century Jesuit Missions, which are now a UNESCO World Heritage Site. Footprint Focus Paraguay is a concise and portable guide to this friendly country, containing detailed information on attractions that are both popular and off the beaten track. The content of the Footprintfocus Paraguay guide has been extracted from Footprint's South America Handbook. Essentials section with useful advice on getting there and around. Written by Latin America expert Ben Box. Comprehensive listings of where to eat, sleep and have fun. Detailed street maps Asunción and other important towns. 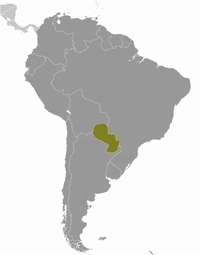 Guaraní, an indigenous language of South America, is spoken in rural Paraguay, the Paraguayan capital of Asunción, and the coastal communities of Brazil. With over 7,000 entries, this is a comprehensive bilingual Guaraní/English dictionary. This volume provides parts of speech, illustrative examples, and etymological notes for words derived from Spanish. A pronunciation and orthography section is supplied to ensure that users are understood when travelling. Met op de omslagflappen uitspraakregels en idiomatische uitdrukkingen. Bevat woordenlijsten Guarani-Duits en Duits-Guarani. Paraguay ist das einzige Land Lateinamerikas, in dem sich bis heute eine indianische Sprache als allgemeine Umgangssprache einer ganzen Nation erhalten hat. Seit 1992 ist Guarani sogar neben dem Spanischen offizielle Landessprache. Fremde, die Guarani können, sind etwas absolut Unerwartetes und Außergewöhnliches: Ihre Sprachkenntnisse werden Ihnen ungeahnte Möglichkeiten eröffnen. Mit einem für Anfänger ausreichenden Wortschatz, einer auf das Wesentliche beschränkten Grammatik, einer Menge sofort anwendbarer Alltagssätze und -formulierungen und einigen Verhaltenstips kann man viel Interessantes über Paraguay, seine Bewohner und deren Lebensgewohnheiten erfahren. Dieser Sprechführer richtet sich vor allem an Reisende, die auch das ländliche Paraguay besuchen und ein besonderes Interesse für Flora, Fauna und die traditionelle Kultur des Landes mitbringen. Paraguay has a world heritage site in the south (Trinidad Jesuit Ruins). Much of the land consists of vast ranches, or Estancias. 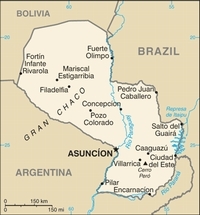 Bevat bijkaart van de regio Asuncion. Geclassificeerd wegennet, grotten, musea, historic sites, meren en rivieren, zandeilanden, heuvelachtige gebieden, nationale parken, toeristische informatie, ziekenhuizen, hotels.